Miss Liberty showed up again on the US five cent coin in 1883. The Shield Nickel, in production since 1866, was viewed as rather plain, and had few defenders when talks began to replace it with something more stylish. Mint Engraver Charles Barber's design consisted of Liberty on the obverse, surrounded by 13 stars. The reverse was dominated by the Roman numeral V within a wreath. 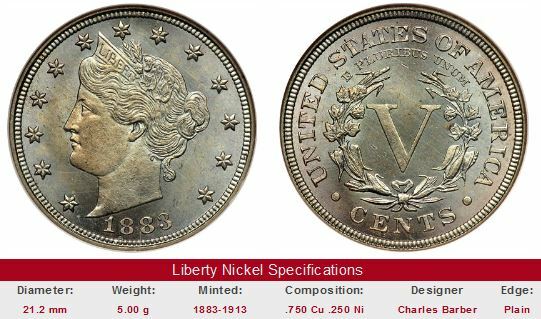 The new Liberty Nickel, also called the "V" Nickel, was released into circulation in February, 1883. Very soon thereafter, the Mint realized a serious omission on the new "V" nickel design had occurred. No where on the coin did the word "CENTS" appear. This oversight gave swindlers the idea of gold-plating the coins, and passing them off as $5 gold coins! Since the Liberty Nickel was new, many victims were taken in. The word "CENTS" was quickly added to the reverse, creating two major varieties of the Liberty Nickel in 1883. These gold-plated "V" nickels came to be known as "Racketeer Nickels" and carry a slight premium due to their connection to one of the strangest events in American numismatics. The most infamous distributor of the Racketeer Nickel was a Boston man named Josh Tatum. He linked up with a friend who gold electroplated thousands of the new “V” nickels. Tatum successfully passed many of these off as five-dollar gold coins, buying small items to receive at least four real dollars in change. The Brooklyn Bridge was opened on May 24, 1883. At top is how the bridge looked in its early days. The bottom photo was taken in recent years. 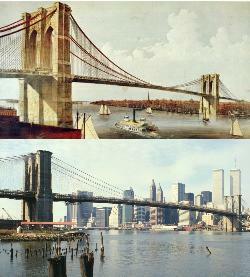 The bridge itself looks much the same, but the New York City skyline has changed dramatically. On its first day, 1800 vehicles crossed the bridge, at a cost of five cents each. No doubt many people paid the toll with a shiny new 1883 Liberty Nickel. Eventually, the law caught up with Tatum. He was put on trial, but was found not guilty on the major charges. It seems he never told merchants the gold-plated coin was worth five dollars, nor did he ask for any change; he simply presented the coin and happily accepted the money offered in return. The court accepted Tatum’s argument that he did not speak falsely of the coin, for as a deaf mute, he couldn’t talk! An unproven tale has been handed down from the case of Josh Tatum and the Racketeer Nickel. Some generations ago, the slang term “joshing” became a popular synonym for the word "kidding", supposedly attributed to Josh Tatum. The next time someone laughs and says “I’m only joshing you”, the image of a speechless man presenting a fake five dollar coin in an 1883 general store ought to come to mind! Regular production for the Liberty Nickel ended in 1912. In 1913, a total of five Liberty nickels were minted, under somewhat suspicious circumstances. Today, this coin ranks among the most legendary of all in American numismatics. On rare occasions, when a 1913 Liberty Nickel changes ownership, the coin commands millions of dollars. When a PF-66 example sold in April 2007, the $5 million price tag created headlines across the general news media. Don't look for a genuine specimen to show up anytime soon on a routine eBay coin auction. Key date Liberty Head "V" Nickels are offered for sale below through US coin eBay auctions. The left hand side of each "Sales Box" is value trend data over a very long period of time for a coin of that date in VG-8 condition. The percent annual increase is computed for comparative purposes. The coin pictured for sale in the right hand side, if any, is not necessarily the same condition coin as that represented in the value trend analysis on left hand side.